You must make reservations at least 5 minutes in advance of the time at Stoney's Stone Crab. PLEASE NOTE BAR AND OUTSIDE SEATING IS OPEN SEATING. RESERVATION UPON PHONE CALL REQUEST. please call restaurant directly. 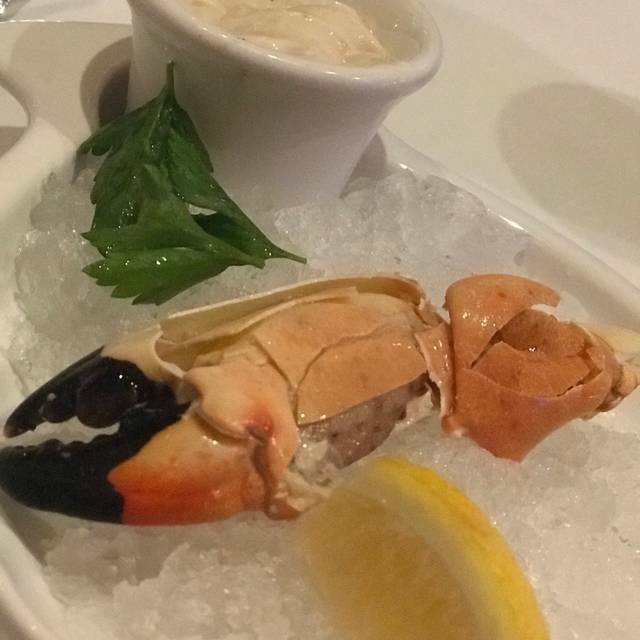 With a stunning setting, a vibrant energy, an impressive menu of locally caught seafood and truly exceptional service, Stoney’s Stone Crab is an ideal place to socialize, talk business, celebrate and indulge. We had a fantastic experience here! I didn’t catch his name, but the host/waiter/manager (I’m not exactly sure if his title) was extremely accommodating and came over to check on us many times. Our server, Jessica, was very knowledgeable about not only the menu, but about things to do in the area. She even brought out a schedule of boat tours for us. The food and service was top notch and we will definitely be back! A return to Stoney's with business clients is always rewarding. Staff are accomodating, food is delicious, and the decor elegant. We enjoyed Lobster Mac n Cheese with our drinks during Happy Hour. We sat outside and enjoyed a number of appetizers during happy hour. They were 1/2 price and were great. Sorry, don’t think this place is going to make it. It’s situated in a great area, but considering it was a Saturday night, it was empty! The prices are quite high and the food was mediocre. The waitress was all about the up-sell. “Running a special on crab tonight” = $100 special. “House salad or caesar salad with that meal?” = $10 extra for a salad that we all assumed came with the meal and no one wanted. When we chose a moderately priced bottle of wine she suggested something that wasn’t on the menu but was $40 more which we declined and she gave us attitude. This was a pleasant surprise. The service was great and the food was very good. Our server made great suggestions and the level of service was perfect. Checked on us but not overbearing. Service could be better. Asked for things that we never received. Food was good for the price. Bread pudding was served cold... would be so much better if it was warm. Overall, an okay experience and would have excelled if the attention to customer service was improved. Live love the lobster MacnCheese! Service is impecable. For a seafood place, the steak was so much better. The lobster was overdone and tasteless. Great fried shrimp! My husband had the grouper and he loved it as well. We were celebrating a birthday and the staff went out of their way to provide balloons and treat us to a glass of champagne and also a dessert. Service was great and the stone crabs were delicious as were the mussels we had. Would definitely go again. Loud when games are on. The service was extremely slow. We waited for 10 minutes for anyone to notice us. We ordered beverages from a bar waitress and they were not delivered. A second person took our beverage order & still they were not delivered. Finally, a third person took our beverage order. The food was overcooked and the condiments we asked for were not delivered for another 10 minutes and the food was then cold. Cindy I our waitress was outstanding along will all others. Atmosphere was incredible! The crab came out frozen. We expected it to be steamed. No one asked but I heard later we had a choice. They took it back and brought it out again still frozen. And they only took off one dinner. Very disappointed. Will never come back. Worst dining experience ever. Service was almost nonexistent and the food was not good. Very disappointing, as the location invited you to explore the marina after dining. Will not go back or recommend. The wait staff doesn’t seem to be inform on the menu choices. The food was good but the service wasn’t. Had to wait forever for the bill finally called the manager over. I was not thrilled with this restaurant. They were out of the clams I ordered and the replacement were overdone and chewy and too large to be considered steamers. Our server was odd. We paid in cash and she counted it at the table 3 times out loud. It was uncomfortable and weird. Maybe someone before us had shortchanged her? I will not be visiting again. I was very disapointed in the quality of the food. The shrimp were old and rubbery. The clams were gritty. The menu said that the sampler platter would have lobster and it did not. It was very slow (we were one of 3 tables) and although our waitress was very sweet, she forgot my sister’s soup and goofed up my drink. I would not recommend eating at Stoney’s. I was concerned about trying out this place as the poor service was mentioned in a few reviews. But we had outstanding service provided by Jill. Our orders were placed quickly, our cocktails arrived quickly. She checked in on us frequently. We did arrive for an early dinner seating. Food was very good, but the service left much to be desired. We ordered 1 doz oysters and 1 doz clams. The oysters were poorly shucked and tasted more like gulf ones then bluepoints. They were also served without seafood forks, lemons and crackers. When we asked for the forks and lemons, we were given only the forks. It took the hostess to notice that something was amiss. She immediately went into the kitchen herself and returned with the missing lemons. The balance of the meal was delicious and properly served and we were treated to another drink. And then came dessert; we had ordered one extremely fancy dessert and asked for two forks. 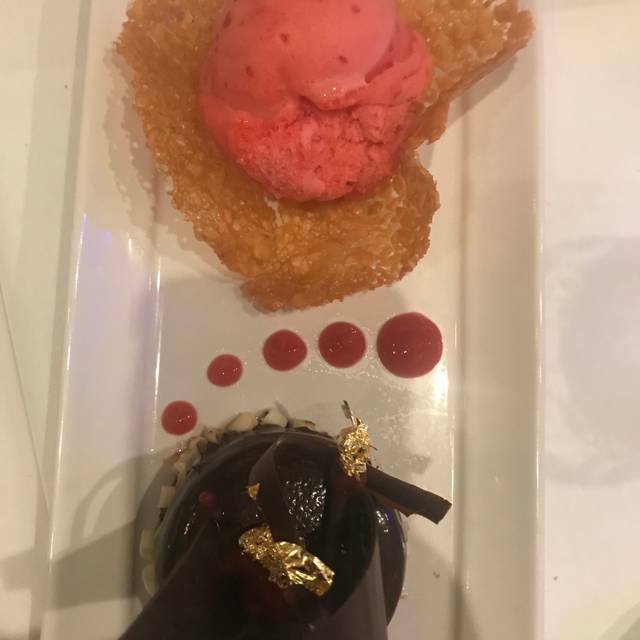 When the dish arrived after an inordinate wait (the dessert contained chocolate covered strawberries and I asked if they were dipping them to order and was told YES!). When dessert arrived it came with the two forks as requested but with only one small dessert plate. Fortunately, the couple at the next table had an unused bread and butter plate which they gladly gave us to use. Because the actual food was so good, we would be willing to try this place one more time hoping that the service improves. The food quality was good, service was good but the ambiance was average. We liked the location, menu selection and drinks were very reasonable pricing. Fresh fish, generous pours on the alcohol. Good service, pace was perfect. No complaints. 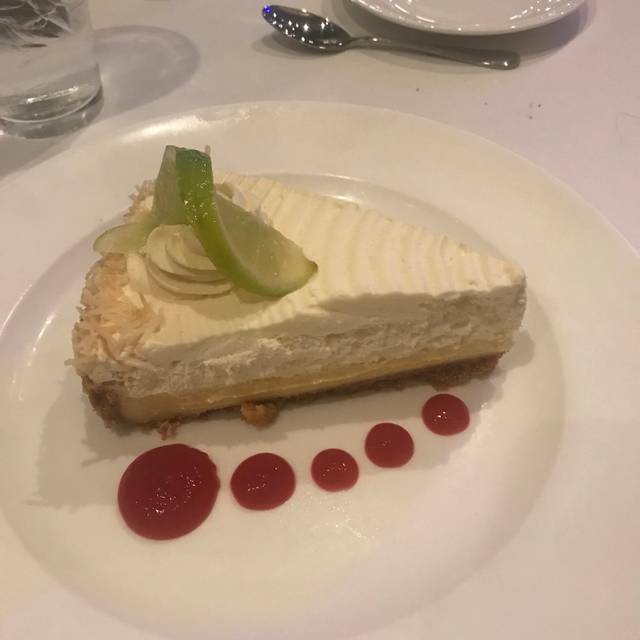 My husband and I went with another couple on a Saturday night in February. You would have thought the restaurant would have been busy but it was surprisingly empty so you would think we would have had fantastic service but unfortunately it was some of the worst service I've ever experienced in Naples. I believe she gave false information telling me the salmon was wild, I asked her to double check and she came back saying yes, it was wild but after reading a different menu the I noticed salmon was Atlantic salmon which is always farmed. So I ended up ordering the wild black grouper with vegetables only and no rice and my husband ordered swordfish with rice and vegetables. When our dinners finally arrived, everyone received fish with rice and vegetables there were no orders that had vegetables only. I decided not to make a fuss and just eat my dinner, but biting into the fish I could tell immediately it was not black grouper I asked the waitress to check and make sure that my fish was grouper and she can came back and said it was but about halfway through the meal I realize that my husband has been served my grouper and I have been served his swordfish. The waitress did offer to make me a new meal which I tried to tell her I didn't need one because I had already eaten almost all of the wrong order. She brought me a new meal anyway which I just end up taking home. I would've much rather have had her comp the meal or at least a glass of wine for serving me the wrong dinner and not and serving me rice instead of vegetables. It was also disappointing that a manager never came over to our table to see how things were going or come and apologize for the mixup. This place has pretty high prices so you would expect excellent service but I feel like I could get better service at an Olive Garden at least there manager might check on me every once in a while. We are hopeful that the establish moves on. They are only 10 weeks old. It was quiet but the staff was amazing. We were happy with Leo and it was his 4th day. Michael was a great manager and visited our table on two occasions. We will wait a few weeks until the wine menu is updated. Good luck to all and see you soon. This was our first time at Stoney's Stone Crab and we all enjoyed our meals and had a wonderful waitress. Good, not great. Happy Hour prices are attractive, food and service are acceptable, again, not exceptional. Jevq- Thank you so much for the review, we're glad you had a great time! Excellent food and service. But it was New Year's Eve and most of the tables were empty. Had the same experience at lunch. Love their inside out grilled cheese sandwich at lunch. server Joyce = excellent service. however more than an hour passed from placing order to delivery of entrees with no explanation or apology. Food arrived at room temperature at best. premium prices for poor kitchen. perhaps they were understaffed. nice people but they let us down and did not even acknowledge the situation. on the other hand, the appetizers were tasty and promptly served. Service was exceedingly poor. Server had no knowledge of the menu or drink selection. Order was taken after sitting in restaurant for 45 minutes and well after appetizers were finished. Appetizers were very good but entrees were ok. Very disappointing experience. We went for stone crabs Christmas Eve, guess what? No stone crabs at all. We should of left, but I’m glad we stayed to tell you that it is really not a good place to dine. We usually go to Trulucks for stone crabs or pick them up at Wynn’s. Change of plans brought us to Stoney’s. Poor service, there was a private party in half of the Restsurant and it was really loud, kids screaming, no control.